Lured to gangs by the certainty of daily adrenalin highs, and living a life he thought was carefree, Dan Goodman already had two children by the time he was 19. Harald Breiding-Buss talked to him as he and his life settle down – with yet another kid. Hooning on Harleys, every weekend on the piss, a couple of burglaries to round off the week for the mates back at the gang -that was Dan Goodman at 16, following in the footsteps of his older brother and some of his mates. “I thought getting involved with a gang was really cool”. It wasn’t long and he got a pregnant. And yes, he thought about “doing the bolt”, to avoid the situation somehow. Not yet 17 when Jess arrived, he didn’t think he was responsible enough and he felt totally tied down, severely restricted in the carefree life he wanted to have. But neither did he want to let the kid down. At the time, Dan was on the dole, living in the South Canterbury city of Timaru, and his girl lived yet another fifty or so kilometres south, in Temuka. He didn’t think she was the ‘right’ girl for a long-term relationship, but nevertheless he travelled down to Temuka two or three times a week with his own job there. He spent the day there, sometimes staying over, but it would have been hard for them financially to move together. The 1)PB pays better than a teenage lad. Still, the couple moved in together eventually, and ban got a job. He never felt really easy in that relationship, and still, he was ruled by incredible carelessness. By 19 he was a dad once more, a boy this time, Curtis. Why on earth, I asked him, after his experiences with the first child, his feelings of being tied down and overwhelmed by responsibility, did he have another one? He shrugs, not really knowing how to answer this. Unlike with Jess, he was there this time when his child was born. “That was really cool”, he says.”I was really excited, it was a great moment.” But by that time they no longer lived together and didn’t get on too well. “That was really at the tail end of our relationship”, he says about Curtis’ birth. But he kept commuting between Timaru and Temuka, “always for the kids; definitely for the kids”, not for the relationship with their mother. That he believed he had something to give to his kids as a dad beyond money	(his contribution was rather meagre in those days, anyway) and support for the children’s mother is a remarkable insight for a young man. 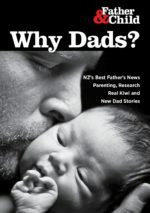 A 1999 survey by the Office of the Children’s Commissioner about New Zealander’s attitudes to fatherhood showed that young people under 20 were the ones who thought the most of parenthood in ‘traditional’ terms: mother gives care, father gives money and protection; even more so than the over 65’s! Add to that Dan’s background of gangs and proven sexual carelessness, and it is hard not to be amazed by his persistence in being as good a dad as he felt he could be. Did he know others? “My brother had a 3 year old [at the time Jess was born), which was good. He ended up as a single dad.” Most of his gang mates also had kids. “Some of them didn’t care, but others were pretty much in the same situation like me. Now 24 years old, Dan has many regrets about those days, especially about his gang involvement. Two Years after his second was born he left Timaru for Christchurch. “I had to get away from those guys” he says. He was in danger of slipping away into a life of crime and booze. His contact now is restricted to seeing them only a few times per year, which bothers him a lot, even though he phones regularly. Because he never lived with Curtis, he feels a stronger bond to his daughter, Jess. Shortly after he had moved to Christchurch he met Chuckle, and they have been in a relationship for three years. By the time you read this, Dan will be a father for the third time at an age, where most of us only start to think about having our first.